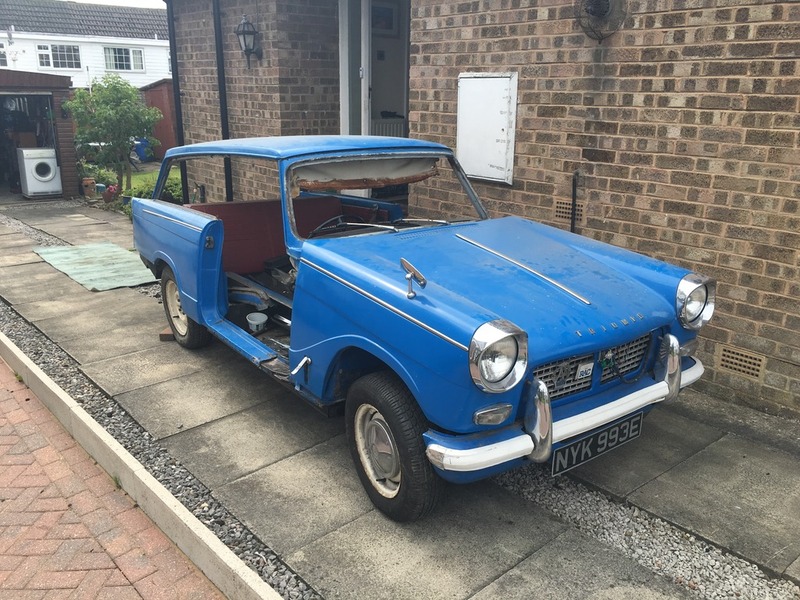 I first heard about the Mongol Rally when a team who were entering the 2016 rally posted on one of the forums I regularly browse, they were preparing a 1960 Singer Gazelle for the rally. This then led me on to youtube, watching various team’s past antics to get a sense of what was involved. After graduating university in July 2016 I spotted an advert on a Triumph forum, for a Herald 1200 estate that seemed fated to go for scrap. After having the car delivered to Mike’s parents we set about assessing the amount of work ahead. We were told that the car ran and drove (4 years ago) before the previous owner passed away, so we decided to see if we could get it to start. We charged the battery up, checked the engine and electrics over, and rigged up a makeshift fuel tank. After cleaning the points and distributor cap contacts it started straight up. Even if the carburettor was dripping petrol onto the exhaust. Other than removing a few parts, things fell quiet. I started a new job in Cambridge and Mike started his in Manchester. However, we made plans to start work on the car in the new year, aiming to complete it by summer 2017. This is to give us time to iron out any issues.